AttributeStudio™ from Geomodeling includes breakthrough features for fractured reservoir characterization using visualization and analysis of AVAZ, VVAZ, and other directional attributes. Anisotropic gradients and velocity differences captured by directional seismic attributes such as AVAZ and VVAZ can be correlated to fracture density and orientation in unconventional reservoirs. AttributeStudio’s Vector Visualization for directional attributes highlights fracture patterns otherwise hidden in conventional seismic image displays. 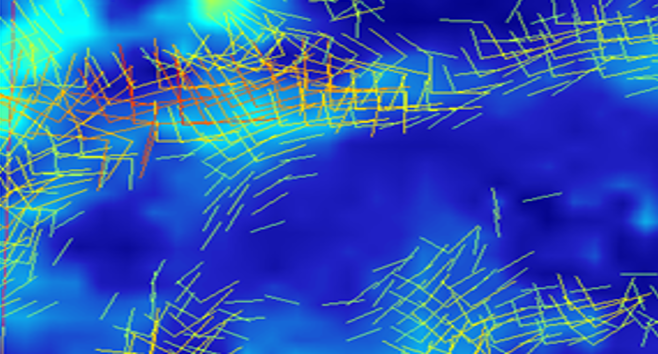 Upscale FMI and other well log image and fracture data to correlate directly with seismic attribute data including AVAZ, VVAZ and other directional attributes. Cross-plot upscaled log fracture density vs. AVAZ and VVAZ data. Correlate Microseismic data with AVAZ and VVAZ data using AttributeStudio’s microseismic data sampling and cross-plotting. Correlate curvature data and other fracture-predicting seismic attributes with AVAZ and VVAZ data using Stratagrids, Color-Blending, and the Seismic Volume Calculator. Using AttributeStudio, you can create vector visualization displays on horizons, intervals, or strata-grids from AVAZ attributes, such as fracture orientation and density volumes. A Vector Plot Wizard guides you quickly and easily through controls for orientation, length, dip and color of vector glyphs, with results displayed instantly in base map and 3D vector views. AttributeStudio includes advanced filtering for vectors including length, orientation, dip, and color. For example, you can limit the display of vector glyphs based on a specific direction or orientation, or where the maximum curvature is less than a threshold value. AttributeStudio’s Vector Visualization also provides unique capabilities for multi-attribute correlation of conventional attributes such as Dip Azimuth, Semblance, Waveform Difference, and Volume Curvature to provide key insights into fractured reservoir characterization. Applying AttributeStudio’s Vector Visualization and other powerful analysis and interpretation tools can improve drilling success and well productivity in fractured reservoirs by identifying areas with favorable rock properties.